'Striped Britches' (Ruby Short, R. 1977). Seedling# 66-73. BB, 26" (66 cm), Late midseason bloom. 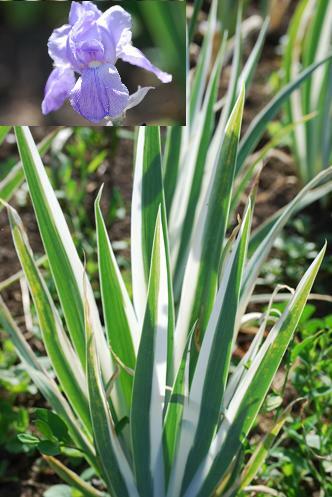 White self; variegated foliage. ('New Snow' x 'Spanish Peaks') X 'Pinnacle'. Eden Road 1981. Honorable Mention 1984. NOTE: Also listed in BB web 'Striped Britches'.